Orchestrated by senior curator of ceramics and glass Leslie Grigsby, this major new exhibition takes a fresh look at the history of dining and dinnerware from the 1600s onward and celebrates how hosts and hostesses brought the natural world into their dining rooms. Foods were drawn from the bounty of nature, and dishes imitated shapes of animals, birds, fruit, and flowers or bore designs after such inspirations. Some patterns had special meaning, and many provide clues to the original owner’s background or social status. The show opens with a discussion of ways in which consumers purchased dinnerware. Early on, the East India Companies controlled much of the world’s trade and made available dinnerware and other goods in exotic new materials and forms. As well as purchasing from shops, consumers special ordered tableware or made design choices using factory pattern books. Nearby, viewers consider some ways in which food was acquired. 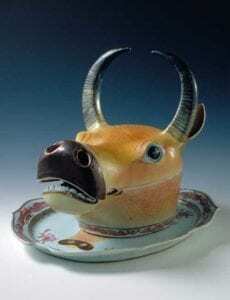 Tureens in the forms of a boar’s head (complete with arrows!) and a cooked goose help illustrate the theme of hunting. In the fishing section, a silver sea turtle tureen swims serenely near a dish in the form of a bucket of codfish. Dishes in melon and cauliflower forms remind us to eat our fruit and veggies! Once dinnerware and food were acquired, there still were many decisions to be made before one’s dinner guests arrived. Cookbooks offered advice on food preparation, and some included illustrations showing how to set the table. 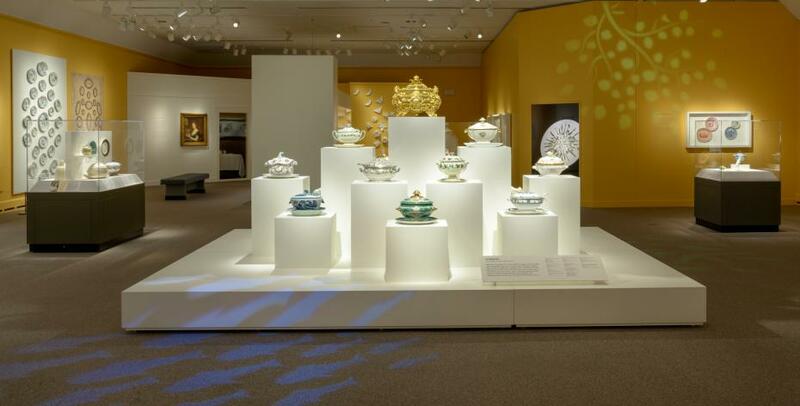 A dramatic display in flowered Chinese export porcelain reproduces a mid-1700s banquet plan. Nearby, a table is set with seashell-pattern dishes once owned by an elegant Boston family. A display of the art of napkin folding features ruffled cloth leaves, butterflies, and even a turkey. 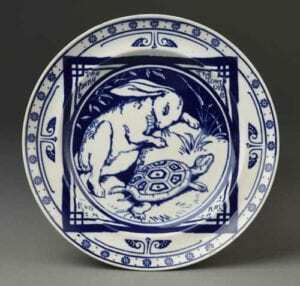 The next gallery presents dinnerware displaying nature designs in Western (primarily European) styles. Ancient themes include Aesop’s Fables and the earliest garden of all, Eden! 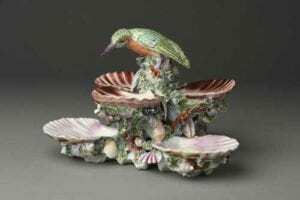 A pyramid of seashell-shape dishes entices the viewer’s eye, and beyond this, a pastoral scene is filled with animal-shape vessels, from geese and a swan to a turtle, rooster, and rabbits. The final gallery space features nature designs in Asian styles. A water buffalo head tureen greets visitors and, within a Chinese pavilion, dishes display richly robed “mandarins” enjoying flower- and pavilion-filled gardens. The exhibition ends with a reminder that the love of nature designs on tableware continues today. Guided Gallery Walks for Dining by Design are offered every Saturday and Sunday at 11:30 am, 1:00 and 2:00 pm. Watch this video highlighting the exhibition! Members free. Included with admission. For more information, read the press release. Read blog posts related to the exhibition on our blog page.